Curlews are back. That is to say I’ve just noticed some in the field as I drove past, I don’t know when they got there exactly. 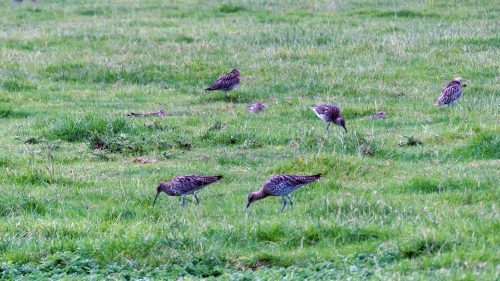 There were just a few for now, a lot of Curlew that return here will have been breeding, or bred in Iceland, but their return here following a few months away each year is one of the signs that summer is rapidly coming to an end. More used to seeing these wading birds solitarily stalking amongst the rocks of Rhos Point, I was amazed the first time I saw them gathered together in a significant number in this field, although it did go some way to enlighten me as to where birds go when the tide’s in. That initial sighting was was back in 2011 when I came here to live and each year since I’ve looked out for them, hoping they’ve had a successful breeding season and that their numbers will be good. 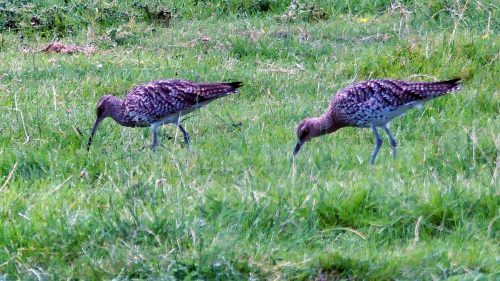 (Not that I know what would be classed as a good number; nowadays the curlew is a threatened species, and I have no idea how present day numbers compare with historical ones for this site.) I’m not confident counting birds, but last year by my reckoning there were somewhere around 80-100 of them here at any one time. I’ve wondered about the attraction of this particular site as a gathering place. In the present day, as fields go this is not a particularly large one and it probably qualifies as ‘rough pastureland’ having coarse grass, a generous sprinkling of thistles and not too much else. 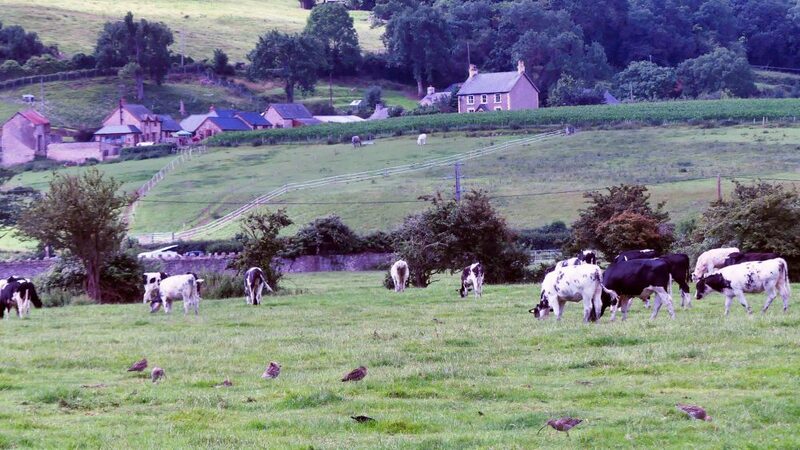 It is farmland, so the birds often have to share the space with large grazing animals; presently it’s cows, earlier in the year it was sheep. 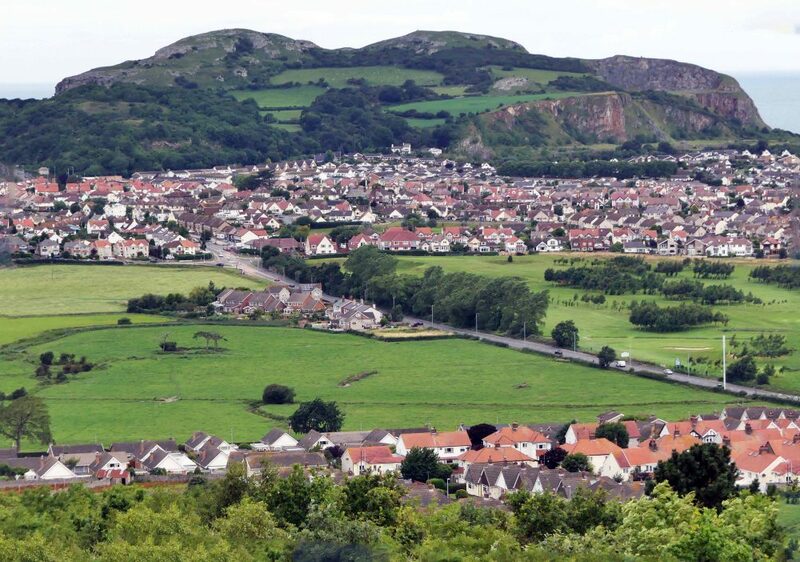 It is bounded on one side by the Llandudno Road, by houses on another two with another field fenced off behind it. On the plus side, it’s conveniently close to the shore & a short flight gets them them there in minutes.The ground here is probably rich in invertebrates as the animals keep the ground well manured, and much of it it floods easily and holds the moisture, keeping it soft for probing with their long bills. 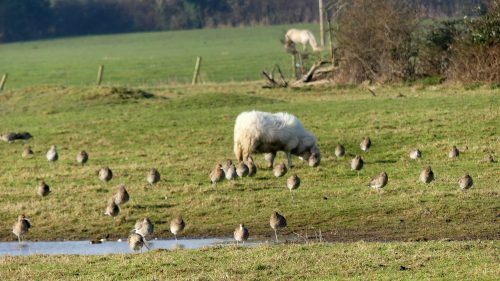 The birds must feel safe here too, when not foraging the flock takes time out to rest and preen their feathers. They seem to be here during times of high tide when there is no accessible shoreline for foraging. They seem to instinctively know the exact moment the tide is optimally in or out and some trigger suddenly alerts them to take off as one and head back there. Maybe that’s all there is to their choosing this spot, but it could also be connected to the past history of the land within which the field is located. Going back to the beginning, a clue lies in the meaning of the name of the village, Rhos-on-Sea, or more properly Llandrillo-yn-Rhos: the Welsh word rhos, translating as ‘marsh’. 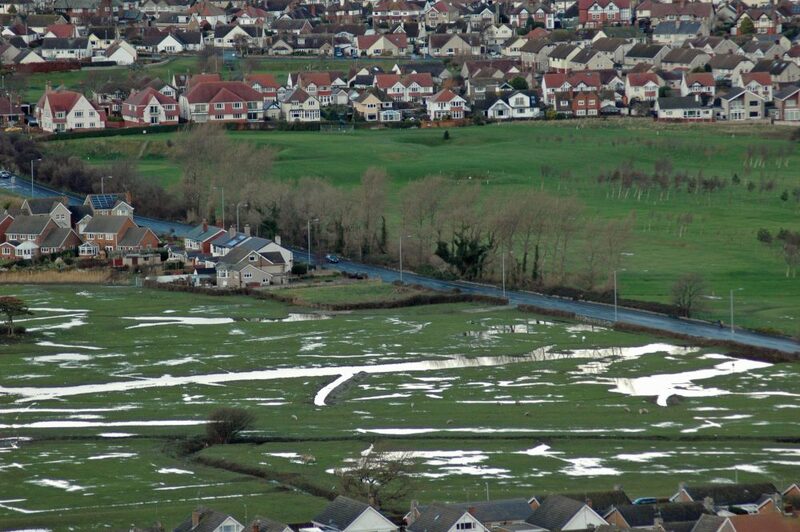 In the distant past, before the construction of sturdy sea defences, high tides would have reached further inland than now and flooded much of the low-lying ground here between it and the hills, forming an extensive salt marsh. The flat area between the Little Orme and Bryn Euryn, from where I took the photograph below is the northern end of the valley of the Afon (river) Ganol, once a significant river which flowed into Penrhyn Bay and also into the tidal river Conwy at its southern end. Along its length several small streams also fed into the river. Looking down onto the well-ordered village of Penrhyn Bay with its network of roads and the modern-day golf course, it’s hard to visualise the wild place this once was, although following sustained heavy rainfall it is easier to see how wet it must have been. The Afon Ganol was by all accounts a dangerous tidal strait, and it formed a natural barrier rendering the land beyond the valley, then known at the Creuddyn Peninsular far more more isolated. Crossings were difficult; the river could be forded here, although the area was extremely marshy. Then in the 1800s, embankments were built at either end of the valley to allow land reclamation. The effort and work undertaken to drain the marsh must have been massive, and hugely expensive, but by 1912 the OS map shows the Afon Ganol as being culverted under the Llandudno Road to the golf links, with a culvert going out to sea, but with still a large marshy area remaining. The establishment of the golf links then required further improvements to drainage and a new outlet for the diverted river was constructed. Dug 2′ below the bed of the river and the link’s ornamental lakes, this outlet then enabled the river and the lakes to be emptied during intervals between tides, keeping the golf course dry. Today the Afon Ganol remains as a culvert with tidal outfall structure, which was updated in 2011 to decrease the risk of flooding. 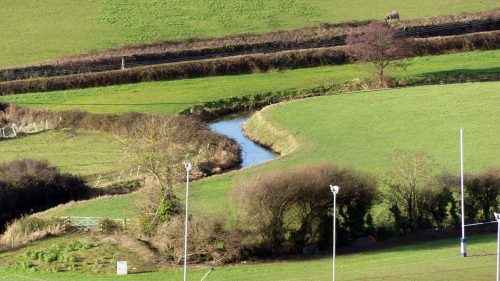 Interestingly, although the original river is now just a meandering waterway and ditch, in part diverted and culverted, it remains still the county boundary between Conwy and Denbigh. 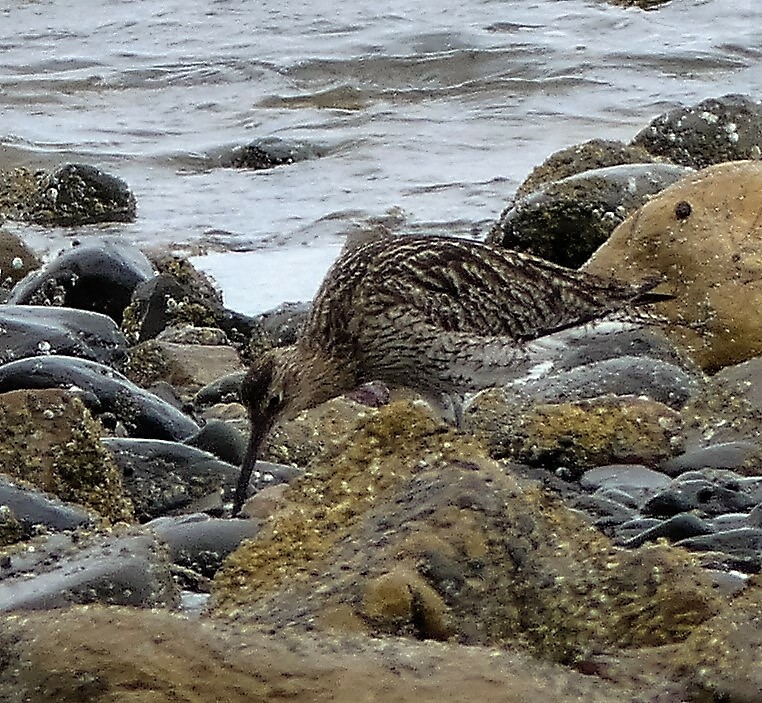 Welcome back Curlews, the place is not the same without you. What an interesting history, and a reminder of what we do when we drain our wetlands. 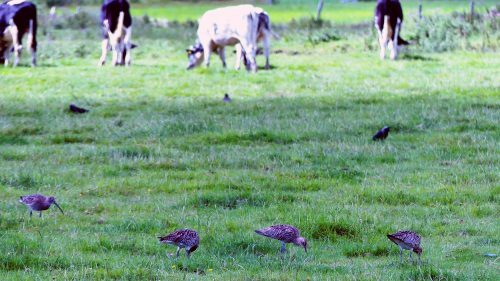 Interesting that curlews still return to the former marshlands. So glad you found the post interesting, I like to try to find out why our wildlife is where it is and what draws them to particular places, although clearly that involves some speculation.There’s something intrinsically reassuring about cycles in nature repeating calmly year on year amidst the chaos and confusion of our human activity. Thanks Becky, they are wonderful birds and we are so lucky to have them so close by to us here for a good part of the year. I’m looking forward to more arrivals in the coming weeks. 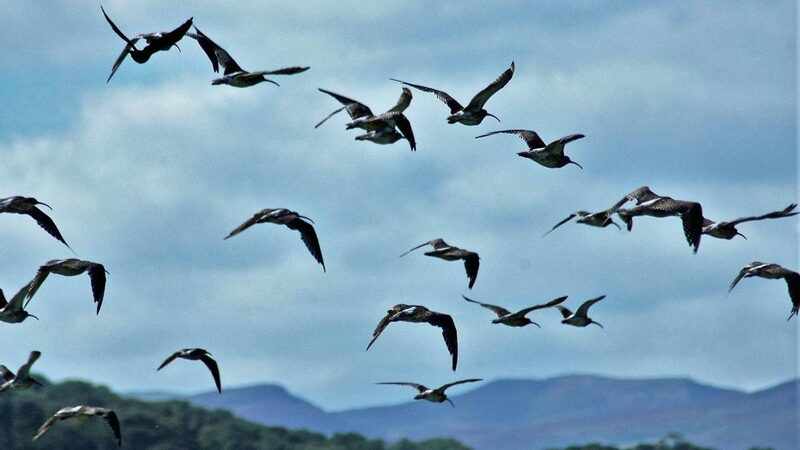 The curlew’s song is one of my favourites, conjuring up images of windswept moors and open skies. Yes, the Curlew’s cry is definitely one of those sounds that reaches further than the ears. It is equally as evocative of wild lonely places when you hear it here too on this rocky shore, especially at dusk when you can almost forget you’re just a stone’s throw from roads and buildings. Another interesting post. Amazing how much landscapes can change with a bit of drainage in place. I should know – I once lived in the Cambridgeshire fens! Thank you Ruth, ah yes, the Fens – a perfect example of the lengths people will go to in order to subdue land to their bidding! I would love to be able to see how this particular stretch of coast and valley, complete with its river, used to look. How wonderful, and a fascinating history of the local landscape, Theresa. I’m glad some space has been left for the birds. The following are my species collections & ids and a work in progress I hope to be able to keep adding to.